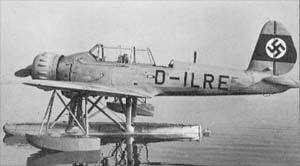 The Ar 196 is the German Navy's most famous on-board catapult aircraft of the Second World War. Used initially and in the main as an on-board reconnaissance aircraft, it was also used for submarine hunting and for attacking smaller ships in all European theatres until the end of the War. In February 1938 an Ar 196 V4 carrying the registration D-OVMB and serial number 2592 was trialled as a test aircraft. The aircraft was fitted with a ventral float in which the fuel tank, two smoke dischargers as well as emergency provisions and additional ammunition was carried. The further in-service testing of the Ar 196B was carried out during 1940-1941. The first Ar 196A's entered service with the Navy late in 1938. This very robust aircraft proved to be quite outstanding. By 1944 some 530 aircraft had been delivered. The last airworthy Ar 196A's were still to be seen in service with the Naval Forces of Romania, Bulgaria and the USSR in 1950.